Surveillance– Covert Stationary and Mobile Surveillance is our specialty. We have the equipment, training and expertise to get the job done, Surveillance can be conducted in many different ways. Child Custody Investigations– Your child’s safety, welfare and well being are our number one priority in all child custody investigations. With around the clock reporting and surveillance as well as live updates of any or all illegal activities that may compromise your child’s safety and well being. Witness Interviews– Anyone can ask questions; Only and expert can truly interview a witness. 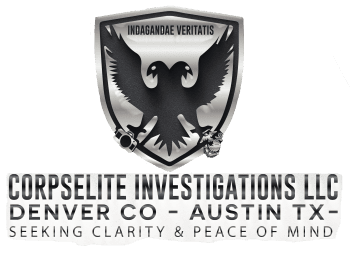 Hire a trained Colorado Private Investigator for your next interview. Accident Investigations– It takes special equipment, training and experience to properly investigate an accident, all of which we have at CEI. All of our investigators are very articulate with any and all details large or small.Investigations. Domestic Investigations– Many times a domestic investigation is required for an individual going through divorce, separation, alimony, etc. to verify someones job situation, living arrangements, life style, etc. Workers Comp Investigations– One of our larger sections of investigations is in Workers Compensation Investigations. Insurance Fraud Investigations– Insurance Fraud does not just happen with Workers Comp. It covers all insurance venues and we cover all insurance fraud cases. Theft Investigations– Theft at work is one of the largest growing areas of crime. Ensure you have the expertise of CEI Investigations to investigate all theft matters. Counter Surveillance– Who better to hire as a Counter Surveillance specialist than a Surveillance expert. We have the expertise you need to ensure your security. Infidelity Investigations– Infidelity investigations require certain expertise and total confidentiality. Don’t rely on just anyone to help you through these difficult times. Asset Verification– Hidden Assets are not the easiest to find and document. Hire a professional Private Investigator to uncover the truth. Activity Checks– Don’t need a full blown surveillance? We offer Activity Checks to document any possible happenings early in your investigation. Skip Tracing– Missing Person Locates Finding missing and wanted individuals is half art and half science. Hire the best scientific artists in the field of Missing Persons. Process Serves– Using local process servers can save you a significant amount of time and money. CorpsElite will locate and serve anyone anywhere they may be located.